Caught fire while tied to Kelley's Island, Lime and Transport Co. dock. 1878, Apr 2 Owned Edward Cunningham & F.P. Wallace, Detroit, MI. 1891, Feb 14 Owned H.C. Case & J.F. Padley, Sheffield, OH. 1895, Apr 11 Owned J.H. Padley of Sheffeild, OH & J.M. Robinson, Lorain, OH. 1896, Feb 4 Owned J.M. Robinson, Lorain, OH. 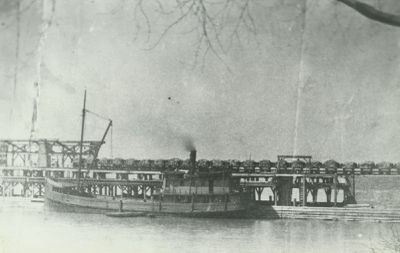 1897, Apr 20 Owned J. M. Robinson, Lorain & Frederick Groch, Sandusky, OH; rebuilt Sandusky, OH as screw steambarge; 108 x 24 x 8.3, 141.72 gross tons & 95.37 net; 16 x 18" hp engine from Phoenix Iron Works, Port Huron; 5 1/2 x 12' firebox boiler. 1897, May 26 Owned A.C. Moss, Sandusky, OH, J.M. Robinson, Lorain, OH, & Frederick Groch, Sandusky, OH. 1898, Jun 8 Owned Frederick Groch, Sandusky, OH. 1901, May 31 Owned Charles Beyschlag, Joseph Lowes & John Beyschlag, St. Clair, MI. 1903, Oct 12 Port Huron, documents surrendered. Purchase reproduction Comment on this item Create electronic postcard Kelley's Island, OH, loading limestone, c1905.